Jockey Club Racecourses has announced a £500m partnership with caterer Compass UK & Ireland. The catering deal is worth a projected £500m in revenue over the ten-year period. 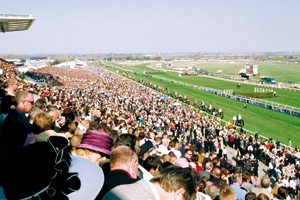 It extends Compass' catering beyond its existing contract with Aintree, Cheltenham, Newmarket and Warwick to include Carlisle, Epsom Downs, Exeter, Haydock Park, Huntingdon, Kempton Park, Market Rasen, Nottingham, Sandown Park and Wincanton. Jockey Club Racecourses chairman Simon Bazalgette said the ten-year deal, which begins on 1 July, would improve the venues' catering offer. "This is the culmination of a long-term strategic objective of Jockey Club Racecourses to bring together the assets we hold within the group so that we may optimise their leverage in negotiating an improved catering deal," said Bazalgette. "To do that, we needed to bring our various existing contracts to a conclusion before embarking on a competitive tender process." The Jockey Club Racecourses group stages 350 fixtures annually, as well as thousands of events on non-race days via its events arm Pegasus Venues.